I think it was the accent that made me a fan of Agent Peggy Carter initially. However, by the time I finished Captain America: the First Avenger, Peggy had become one of my favorite Marvel characters ever. 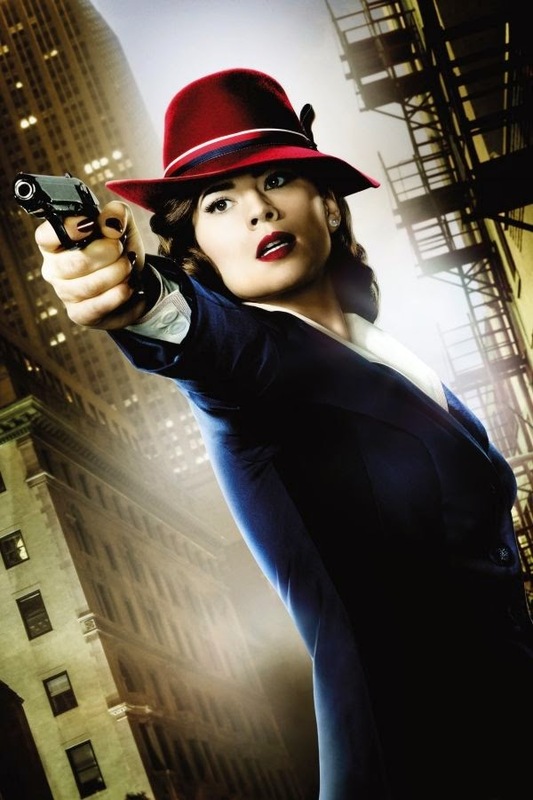 So at the news of Agent Carter starring in her own television series, I was elated. Four episodes in, I haven't been disappointed. I could go on about how much I'm loving the show itself, but there is another aspect I'm especially fond of. That vintage fashion is simply the cat's pajamas! In just about every scene, I can't stop myself from sighing over the outfits of an era gone by. At the end of every episode, I declare to anyone who's in the living room that I want to be like Agent Carter! However, since I'll never keep national secrets or be able to defend myself with a stapler, I'll be content to copy her style. Since a picture is worth a thousand words, I am going to rely on various images to help explain my points in this post. I’ve also done my best to find items in a similar style to Peggy’s for the ensembles shown. Let's start with what we can learn from Agent Carter’s earliest outfits. Since it was wartime, and Agent Carter was serving in the military, her outfits were mostly basic. They consisted of standard army issue, except she typically favored a straight, knee-length skirt to trousers. The essentials for this look are a white blouse, simple skirt, and sensible shoes. Think in subtle shades, especially greens and browns. To accessorize, add a practical leather belt and perhaps a smart black neck tie. Feel free to browse eBay for World War II pins to complete the look! Despite being very basic for most of her World War II scenes, Agent Carter did find an occasion to get dolled up. In her red dress, she shifted from business as usual to an elegant evening ensemble. Still, despite being more formal, Peggy kept this look refined by not overdoing it. The dress is overall conservative, and her accessories are small, keeping in line with Agent Carter's signature classiness. The vibrant red shade boldly brings out her personality and patriotism! To copy this striking style, select a dress that is feminine and flattering, add a pair of matching pumps, and finish it out with a clutch purse and a vintage-esque watch. Moving away from wartime now, Agent Carter's style has changed slightly, but she still embodies simple sophistication. This is a lady with a job to do, and she looks fabulous doing it. Her outfit pieces are well tailored, professional, and fashionable without being frilly or showy. Red, white and blue are her signature colors and they appear in outfits throughout the series. Perhaps my favorite thing about Agent Carter is that she has mastered the look of a woman in the work world. She dresses with dignity and refinement and carries herself with poise and self-respect, showcasing her wits and wisdom more than her womanly attributes. Yet she never looks matronly or mannish; rather, she is the epitome of elegance. To achieve this impeccable office look, opt for dark tones such as navy blue or charcoal gray. Balance it out with a timeless blouse and then kick things up with an unforgettable yet practical pair of heels. If you really feel daring, cap it off with a brilliantly hued hat. Agent Carter was running late to work in this outfit, but she at least she was fashionably late! Her previous rules of office attire apply here: uncomplicated and understated but unmistakably classy. A dark jacket and skirt are contrasted by a lighter blouse. Strappy black heels take the outfit to the next level. This is a very minimalist ensemble, but it has maximum style! The inspiration here is again all about the neutrals! Agent Carter knows how to spin subdued shades into sharp statements. By building a wardrobe of basics, the ensuing outfit possibilities are endless. Even when she's not at work, Peggy stays in style. Here, she opts for ladylike dresses rather than her usual professional suits. In the first example, she dons the American colors of red and blue again. (Perhaps in memory of Captain America?) In the second, she wears one of my favorite outfits, a black dress with charming details. And of course, no outfit would be complete without the proper shoes! The vintage dress is the focus for these ensembles, rounded out with matching pumps, stockings and a purse. - Moderate heels. Don't pick anything too tall, in case you have to run for a mission! - Confidence. Ultimately, Agent Carter's confidence and self-assurance are the keys to her style. - British accent is optional but encouraged. The links I included are just to get you started. ModCloth is my favorite vintage shop, but you can also make some excellent Agent discoveries on eBay, Etsy, and even Amazon. Also check out the site, Rusty Zipper, for real vintage pieces. And don't underestimate your local thrift shops! I've found several skirts, blouses and jackets at Goodwill to include in my agent ensembles. If you don't live near a second hand store, check out the website, ThredUp. They have a great selection of tops, blazers, and skirts that you can creatively incorporate into your collection. Just remember the Four C's of Agent Carter's closet: Clean, Classy, Conservative & Confident! Now go complete your missions - fabulously! I haven't seen Agent Carter yet, but I loved this post! She has such a tasteful and classic style, and I definitely want to update my wardrobe a little to make it a bit more like hers. Great job on this fabulous post! I would love to dress like this. I'm kind of built like agent carter and have similar coloring so I am going to need to give this a try. I've seen some clips from the show and was very impressed even though superheroes aren't really my "thing". "British accent is optional but encouraged." HA. I was so excited when I heard Peggy Carter was getting her own miniseries, since we never really got any closure on her story from the films. Tragically, though, I've got the series recording, but I haven't been able to catch up on it yet. It's great to hear that it hasn't disappointed so far. Great analysis, by the way! It's funny--once you break it down like this, it's easy to see a basic pattern emerge, but it's interesting to see how she mixes that pattern up.